The Recon Scout looks like it has borrowed its design from the Sony Rolly, but it is able to take video footage instead of playing music. 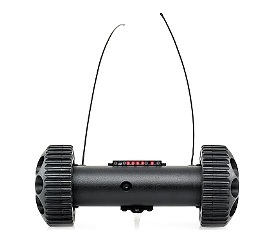 The Recon Scout, designed by a Minneapolis-based company called ReconRobotics, is a durable little mobile camera designed to roll along the floor. It is a discrete way of getting video footage in hostile territory, and has already been successfully tested in war zones like Iraq. It even has an infrared camera with night vision for shooting in the dark. According to Popular Mechanics, the Recon Scout is planned to be tested in prisons. That way, you could send it into areas where no one would want to go, and it will scan some areas discreetly. Now this is way to see what prison life is like. So, the next time a prisoner drops his soap in the shower, he can bend over and…see the Recon Scout. The Recon Scout can be controlled from over 100 feet away, which isn’t that far away, but might be just the distance needed for a surveillance operation. The device can survive a 30 foot drop on concrete, which should make it durable enough for hot zone work. I don’t think that the Recon Scout is available to the general public, but this device costs about six to nine thousand dollars.